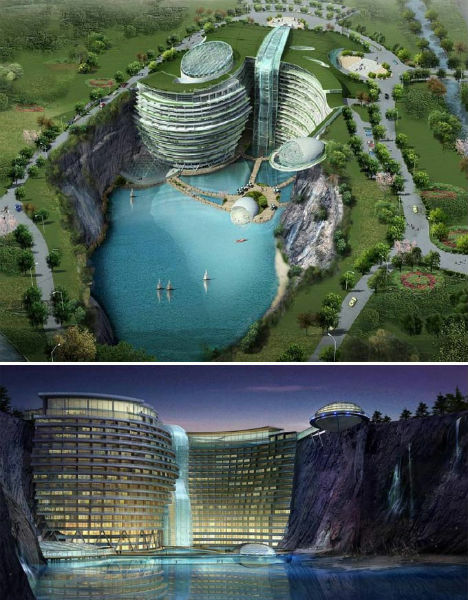 Who wouldn’t want to stay in a hotel that’s located on the sea floor, serviced by airships, precariously perched on a cliffside or adorned with a 10-story statue of a robotic Michael Jackson? 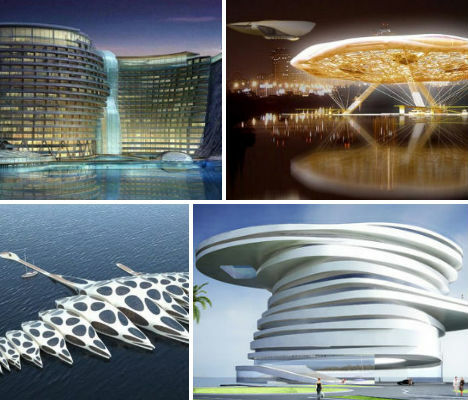 These 14 hotel concepts are imaginative, futuristic and sometimes humorously wacky, but not all of them are destined to be unbuilt forever; some may actually be constructed in the Never Land known as Dubai. 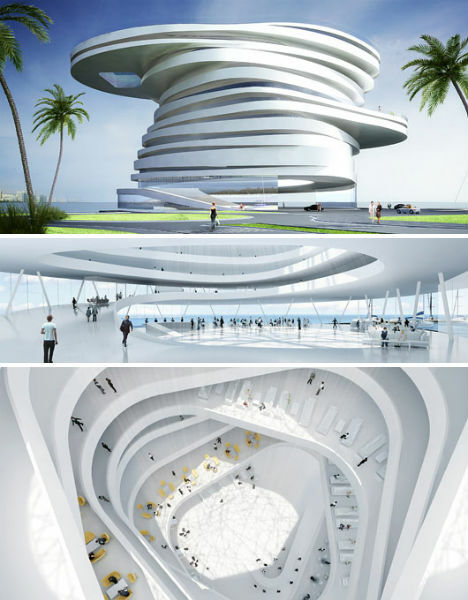 This stunning concept hotel by Heerim Architects takes a little inspiration from Star Wars and a lot from the moon. 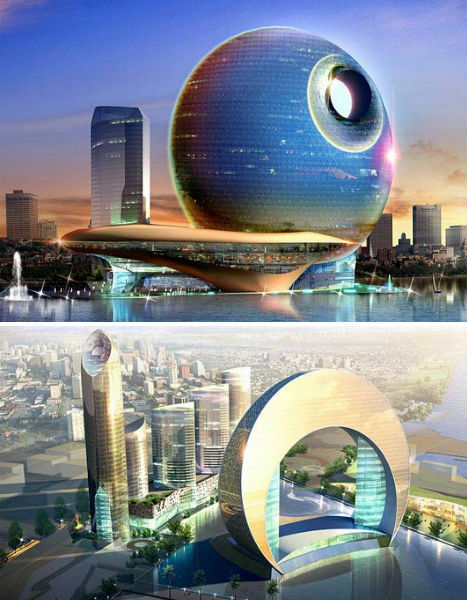 Designed for the Azerbaijani capital of Baku, the duo of futuristic structures are individually named Hotel Full Moon and Hotel Crescent. Their appearance changes drastically depending on the viewer’s location; Inhabitat points out that the Hotel Full Moon resembles the Death Star when seen from below. 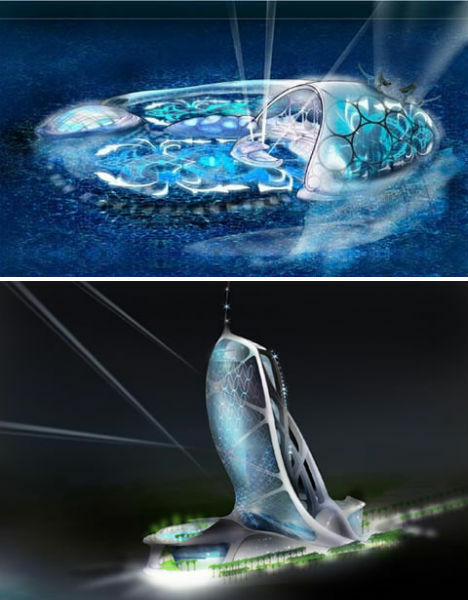 This isn’t concept art from a new movie set on another planet – it’s The Graft Tower, an eco-hotel and vertical farm designed by Diego Taccioli, Sizhe Chen and Tyler Wallace. Imagined as a ‘net-plus resource building’ providing food, water and energy for a neighborhood in San Juan, Puerto Rico, the eco-tourism hotel resembles a living being and literally ‘grows’ by grafting fibers around skeletal frames. 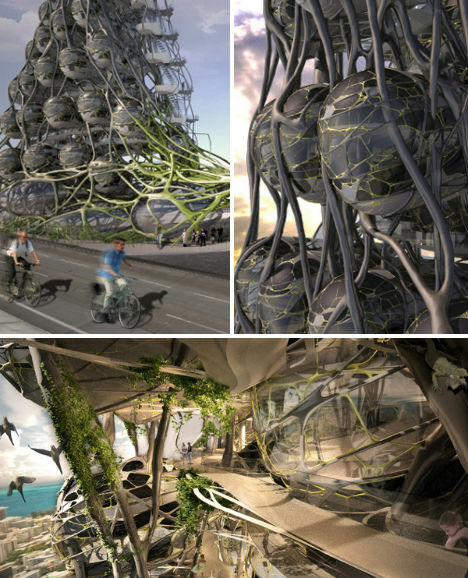 Pod-like hotel rooms and other habitable spaces nestle in the tower like egg sacs in a cobweb. 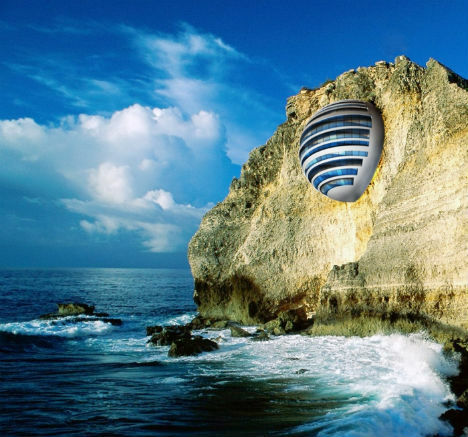 Originally set to open in 2009, the Poseidon Undersea Resort is now in limbo and may not be ready for guests for years yet – if ever. But the concept art sure is fun to look at. 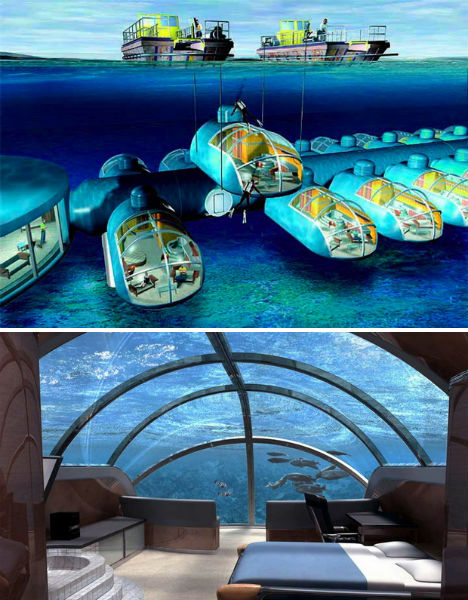 Imagined as the world’s first seafloor resort where you can relax in the lap of luxury 40 feet below the surface of the sea, the Poseidon features 24 suites, one luxury apartment and 48 bungalows in glass pods that give guests astounding views of the crystal-clear waters of a Fiji lagoon. A 7-day trip for 2 costs more than $30,000. 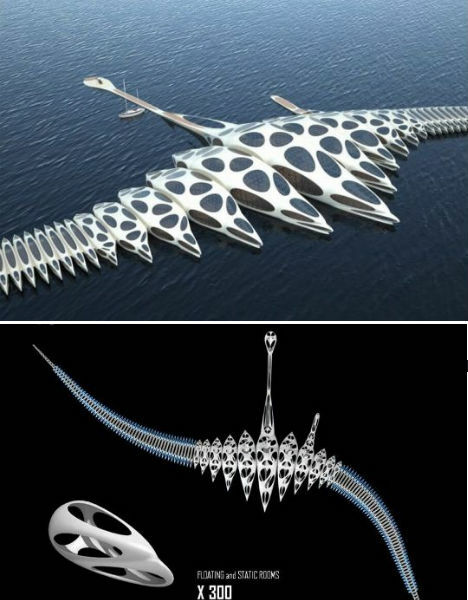 A lace-like hotel on the sea, complete with a “web park”, is serviced by airships in this fantastical futuristic concept by Russian architect Alexander Asadov. Very little of the hotel actually touches the water, protecting sea life, and the open net structure holds parks, roads and hanging gardens. Eccentric and over-the-top just like the man the design is dedicated to, the ‘Michael Jackson Robot Hotel’ features a massive sculpture of – well – Michael Jackson. As a robot. 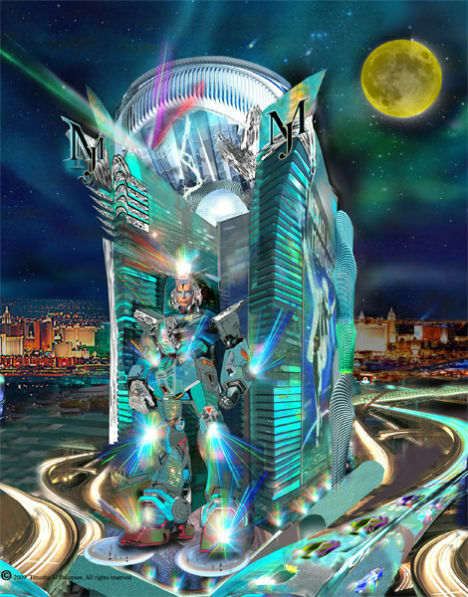 An entry in the Michael Jackson Monument Design Competition, this concept, by Timothy Patterson, is a multimedia entertainment complex in Las Vegas with guest rooms and a shopping center. 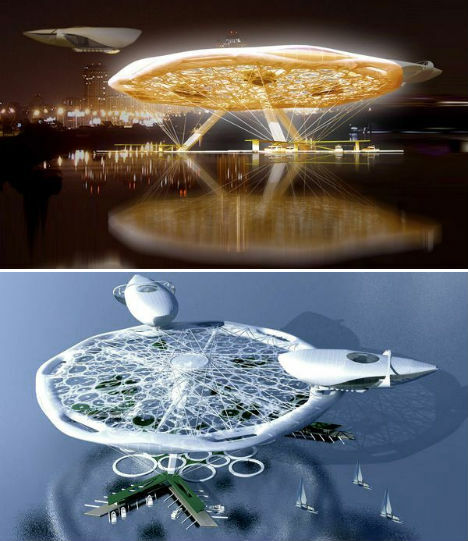 While it’s not clear whether this unusual hotel concept is just an idea or, as occasionally reported, actually under construction in Abu Dhabi, it’s an interesting and unique idea. 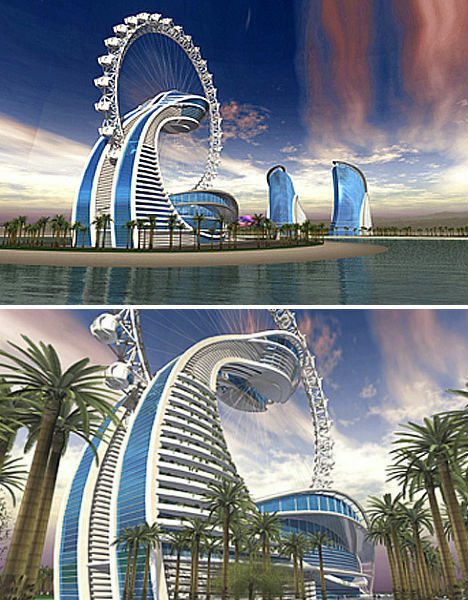 Located on a man-made island, the hotel arches into the center of a spinning ferris-wheel type of overlook with enclosed pods, reminiscent of the London Eye. 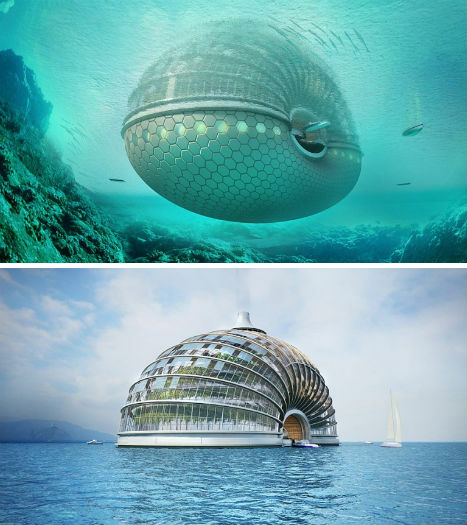 Planned for Dubai, the Hydropolis Underwater Hotel and Resort probably won’t become reality for a long time. 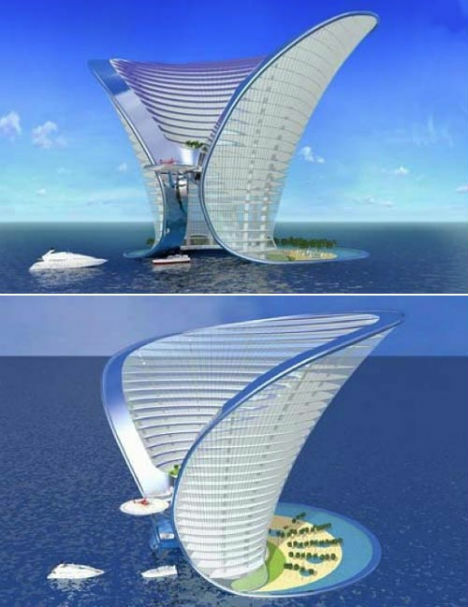 The hotel was to be submerged in the Persian Gulf with an entrance on the surface of the sea and the main hotel structure on the sea floor. 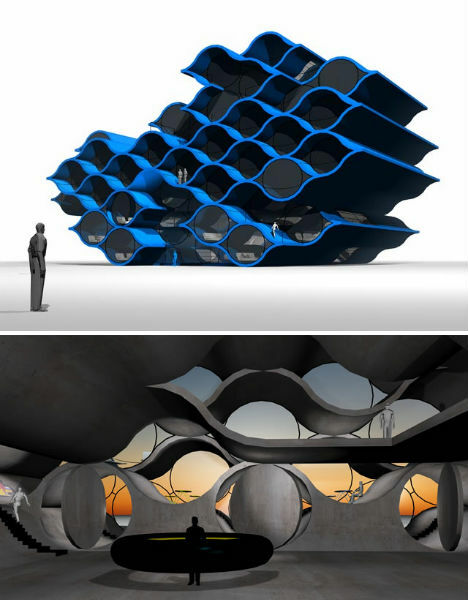 Meant to ‘reproduce the human organism in an architectural design’, the structure mimics the motor functions and the nervous and cardiovascular systems. Fittingly called Hotel Blue Wave, this hotel is made of stacked, curving concrete forms painted bright azure. Inside, the floors flow into one another with stairways providing access; there’s not a right angle in sight. Says designer Andreas Angelidakis, “The project studies modes of temporary habitation such as the beach (put your towel down and claim your spot), and the squat (choose your room, stay for a few months), and they way they can socially and aesthetically enrich the hotel experience."